Mr. Media is recorded live before a studio audience – HEY! WAIT A MINUTE! I’ve always said that as a joke! Where did you people come from?… Oh, that’s right, we’re on location for the first time at the fabulous Globe Coffee Lounge in the new new media capitol of the world… St. Petersburg, Florida! Peter Golenbock is one of the most prolific writers I know or have ever heard of. His books could fill an entire shelf in your library – and maybe they already do. That’s the Golenbock name alongside Johnny Damon on Idiot, next to Sparky Lyle on The Bronx Zoo and with Graig Nettles on Balls. He went solo for Bums: An Oral History of the Brooklyn Dodgers, and Wild, High and Tight: The Life and Death of Billy Martin. More recently, he published George: The Little Rich Boy Who Built the Yankees Empire – about the late George Steinbrenner. You might also have heard about his only shot at “fiction” to date, 7: The Mickey Mantle Novel, in which we read tantalizing stories of The Mick’s trysts with women – including Marilyn Monroe. 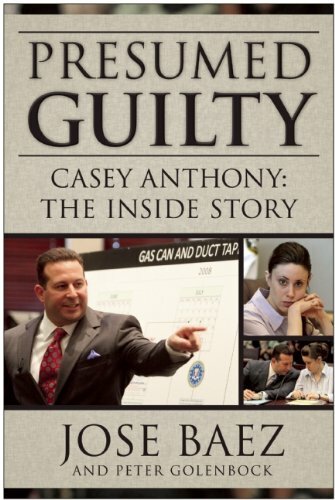 Ordered Presumed Guilty from Amazon.com by clicking on the book cover above! Just when people had him pegged as a guy who only wrote baseball books, Peter turned out an equally dazzling series of books about other sports, including Landry’s Boys and Cowboys Have Always Been My Heroes, about the Dallas Cowboys; NASCAR Encyclopedia, NASCAR Confidential and American Zoom; Personal Fouls about Coach Jim Valvano’s days at North Carolina State; and there was Go Gators! an oral history of Mr. Media’s alma mater. There have even been two books with ties to St. Petersburg, his current city of residence: Forever Boys, about baseball’s short-lived senior league, and Thunder and Lightning, a memoir he wrote with Tampa Bay Lightning founder Phil Esposito. Did I mention he also found time to write In the Country of Brooklyn and helped the late actor Tony Curtis write his memoir, American Prince? Gosh, next time, I gotta get a guest who’s less accomplished. We’re almost out of time!